Size: 16 x 13.8 inches. This beautifully engraved map shows all of Scotland and the Hebrides islands with a stippled sea and strong topographical features in the interior. It was compiled from Mercator's landmark map of the British Isles  with some corrections. 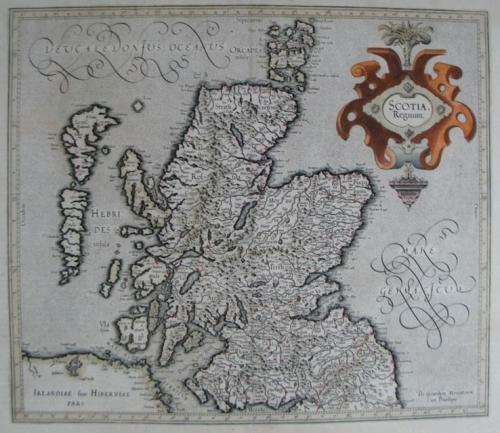 Mercator's outline of Scotland remained the standard until the Robert Gordon map was published by Blaeu in 1654. The condition is very good. Original colour on full sheet with very wide margins. The colour is slightly faded and map is repaired in lower half along the centerfold.